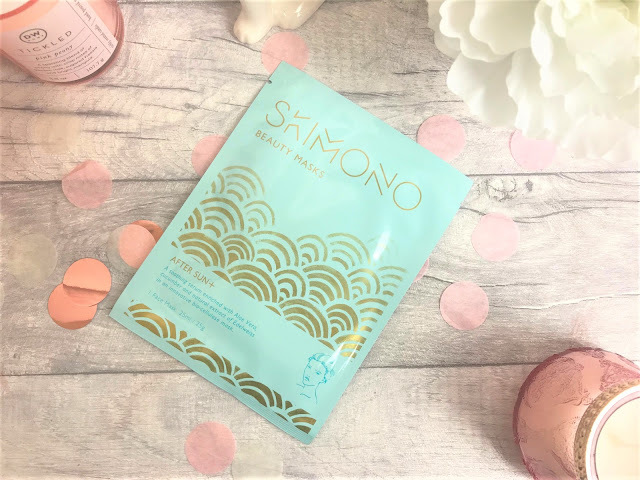 I was recently, very kindly sent some face masks to try from a brand called Skimono, which I hadn't previously come across, and so as always with new brands to my blog, I thought I would give you a little background information, and then tell you all about these fabulous face masks. 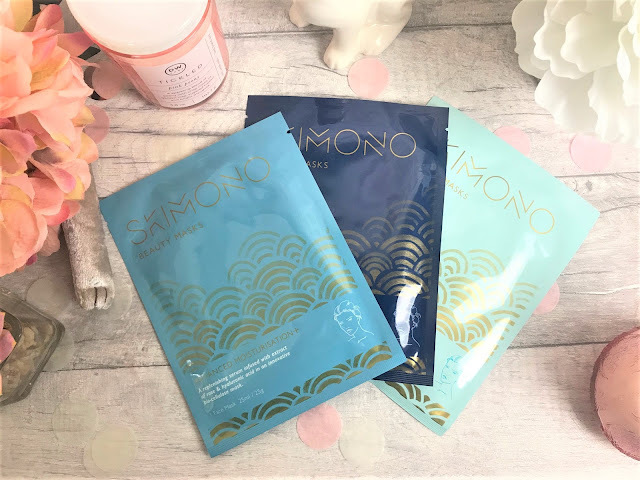 Skimono first launched in 2015, and so are a fairly new brand in the beauty world. They wanted to bring a solution to combat the damaging effects of modern lifestyles on the skin. Skimono are the first UK company to focus exclusively on a range of beauty masks that tackle problem skin caused by commuting or long distance travel, sun damage, pollution and stress. The innovative mask technology from Asia transports nutrients within the serums deeper into the skin, improving the complexion and resulting in skin that is fresher and smoother. If you are lucky enough to be going on holiday this year, then I would recommend popping the Skimono After Sun+ Beauty Mask in your suitcase. 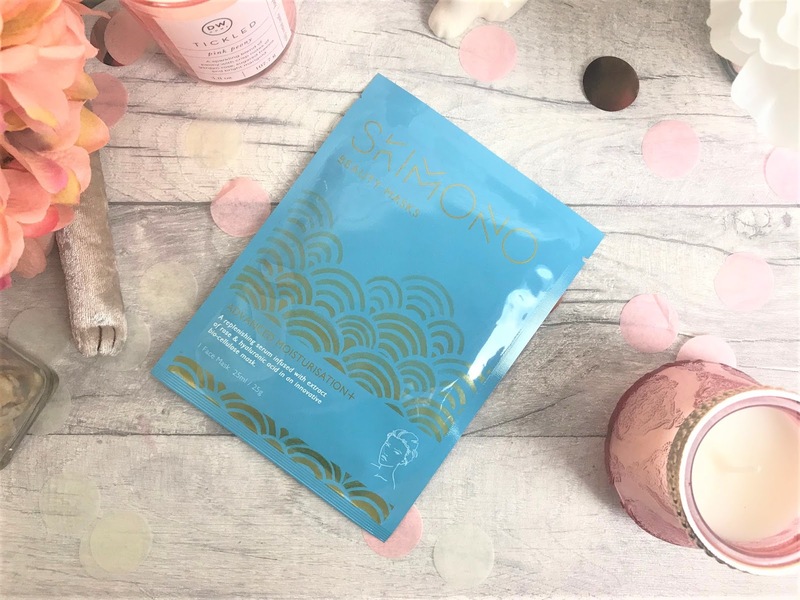 After a day in the sunshine, this mask will help to repair and protect the skin, cooling and refreshing it, and keeping it well hydrated. This mask contains a soothing serum which has been enriched with Aloe Vera, Cucumber and Edelweiss and feels incredibly rejuvenating once you have applied it to the skin. Skimono recommend popping the mask in the fridge for an ultra-cooling experience and whilst they don't state how long you should keep the mask on for, I find fifteen minutes is a good amount of time for the mask to work, however you can always leave it on longer. If you suffer from dry skin, then the Skimono Advanced Moisturisation+ Beauty Mask is the one for you. The serum in this mask has been formulated using extract of rose and hyaluronic acid, which is perfect for keeping moisture locked into the skin, therefore helping the skin to remain nourished and hydrated. Rose is really good for calming the skin too, so if you suffer from irritation due to dryness, this is going to help calm that down. The mask itself is a full sheet mask, rather than one in two sections, and so you can press it onto the skin to fit the contours of your face. After use, I found that this left my skin so soft, and due to that hyaluronic acid, there was no dryness throughout the day. It is never too soon or too late to start using anti-ageing skincare, and Skimono even have a mask for that. 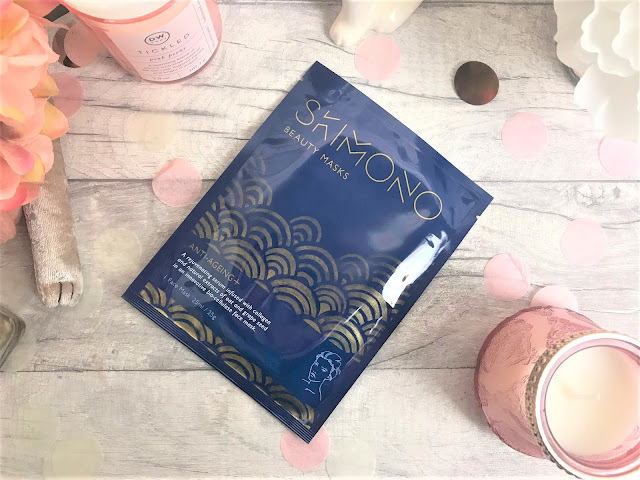 The Skimono Anti-Ageing+ Mask contains a serum formulated using collagen and natural extracts of oat and grape seed to help give the skin a firmer and smoother feel and appearance. Each Skimono Sheet Mask contains 25ml of the serum, and so I like to massage the remnants from each mask into my skin to give even longer lasting results. I love to take 30 minutes to an hour on an evening, even if it is just once a week, to run a hot bubble bath, pop a face mask on and relax, it really does you wonders. The Skimono Face Masks featured are priced at £15.00 each and can be found online at Skimono.